( A Must Have Dress ) perfect for occasions of dancing party, wedding, pageant, birthday, summer holidays ect. This is a gorgeous floor length dress for girls from 7 to 12 years. It is comfortable, special and nice dress for your girls. It is easy to wear with the hidden back zipper. There is a bow tie at the back. 1. The size above is measured by hand and the size of the actual item you received could be slightly different from. 2. Please understand that due to lighting effects, monitor’s brightness, contrast settings ect., there could be some slight differences in the color tone between the pictures and the actual item. 3. The dresses in light colors will be slightly see-through, especially the ones in SNOW WHITE and LIGHT BLUE! 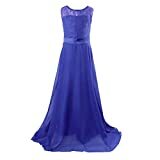 This entry was posted in Wedding Store and tagged 1011years, Blue, Bridesmaid, Chiffon, Discoball, Dress, Floor, Flower, Girl, Girls, Gown, Lace, Length, Long, Roral, Wedding by Formal Affair. Bookmark the permalink.